With approximately 200,000 members the Mafa are the largest and politically dominant ethnic group of the 14 ethnic groups which live in the northern Mandara Mountains in Northern Cameroon. The Mafa practice a subsistence economy and are sometimes still referred to as Matakam in the literature, a term which originates from the times of slavery and refers to “those who are easy to catch”. The Mafa are a patrilinear society. Lineage is defined by the father. After marriage the women move onto their husband’s farmstead, a patrilocal living arrangement which requires the women to leave their own families and settle in new ones, those of their husbands. Here they are treated as strangers all their lives. Between 1981 and 1997 the author lived with the Mafa for a total of 28 months. During this period of time she collected 157 narratives (fairy tales, fables, creation myths). The largest part of these, which are mostly told by women, are presented in this study. The Mafa regard their narratives as reports of events which have taken place in the form narrated or a similar one in the past. The tales deal with all aspects of life: birth, childhood, marriage, motherhood, work, belief systems, death, the afterlife. Even the “magical tales” are believed to be true. Magic, which is regarded as fantastical in Western rational thought, appears real to the Mafa. The narratives tell about situations of conflict in which the protagonists or antagonists deviate from the respective social norms and demonstrate a rich spectrum of types of human behaviour. The culture provides the framework of possibilities and limits which determine an individual’s restrictions or opportunities for development. No “innocent Ethiopians”, naïve savages, or exotic children of nature are depicted, rather human beings: guilty and innocent, naïve and sophisticated, wild and gentle, genuine and disfigured, as they are everywhere. The solutions presented do not only provide insight into the prevalent morals, but also show tolerance for deviating behaviour. Trickster-narratives, which form about one third of the oral literature of the Mafa, may be understood as didactic narratives. The author based her in-depth interviews on the narratives. The male and female narrators simultaneously became informants. The topics of the interviews arose out of the tales; marriage, funerals, slavery, religious belief all play a role in the narratives. What the author always inquired about was the relation a tale had to the life of the people today. The interpretations of the narrators and the examples from everyday life they associated with them are a further ethnographic source which has been made accessible by the author. The examples show what is specific for Mafa culture in the narratives as well as which motifs are discernible as generally African or even universal. This monograph on the Mafa in Northern Cameroon includes the major chapters of a classical monograph, stressing the women’s perspective: childhood, being a bride, marriage, motherhood, the mother’s sister, the world of men (including gender relations, mutual dependence), death, the world beyond, and conclusions. 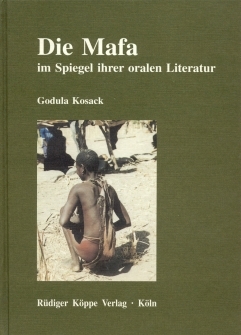 Kosack has lived with the Mafa for a long time, during several field trips with her husband and three children, and she includes self-reflexive accounts in her ethnography. An appendix includes a glossary of Mafa terms, the stories used in the book, the narrators (25 women, 11 men, and 219 interviewed women who have been cited in the monograph). Kosack has recorded more than 200 life histories of women. Thus she constructs an ideal-typical woman of the Mafa society, who from the first day is subject to customary social relationships which are based on values based on belief systems. Belief systems are based on economy, the way of production – which has resulted from historical development. All of these processes emerge from people’s relations with each other and with environments – they are illustrated by and exemplified with 158 stories retold in German, with commentaries of interviewees and the authoress.